In many of our lives women play significant roles, from being mothers, daughters, sisters, grannies, aunts and cousins, but also as role models, providers, leaders, workers, carers, inventors, the list is endless. Every year on the 8th March, the world celebrates International Women’s Day, a dedicated day about supporting the roles and acknowledging the achievements of women. We also honour women on this day because it remains the sad fact that women across the world continue to experience challenges and inequalities simply because they are women. So we further take the opportunity to raise awareness and show support for women’s rights and equality. 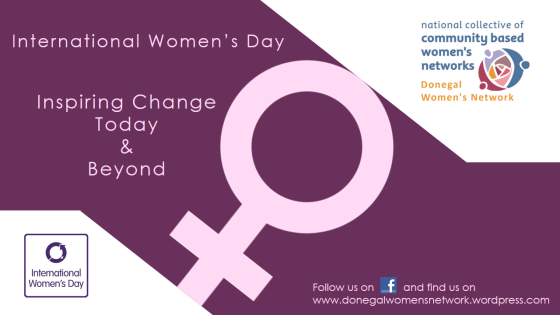 This year NCCWN-Donegal Women’s Network in partnership with Change Makers Donegal honoured women by holding a series of workshops with women from across Donegal and discussed with them how women are making a difference locally and globally, while also looking at the issues effecting women.